My parents are in the Upper Peninsula of Michigan and the Mid-West in general on vacation. The KareBear is a UP native, from a small town outside of Marquette (which isn't really a huge city, but its got a university and whatnot). 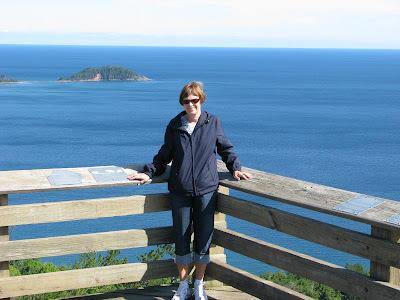 She returns there very frequently, usually once every year or so to wreak havoc upon unsuspecting Yoopers. 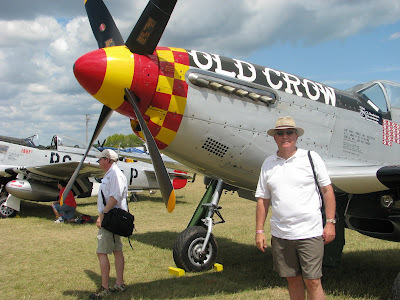 The Admiral also got to attend the EAA AirVenture (aka: The Osh Kosh Air Show), one of the biggest airplane-dork conventions in the country. Anyhoo, The Admiral sent me some pics, so I thought I'd share. The KareBear will be shocked to learn that someone put an enormous body of water behind her while she was looking away. Not sure how you're going to scare the be-jeezus out of everyone this Halloween season? 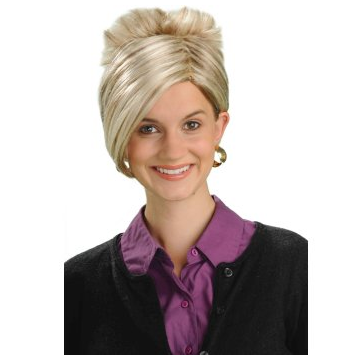 They've made a Kate Gosselin wig (that's the Kate of "Jon & Kate Plus 8" fame). Oh yes. They have. The name of this product? The "Eight is Too Much Wig". Ouch. I cannot imagine what it must mean to Kate that, for a good chuckle at parties, people will now be dressing as her for Halloween. Or what that means for her now ex-husband. And kids. But I have to think that unless you're Elvis Presley or the president, its kind of a sure sign that maybe life is very publicly not working out for you. So, you know, I very much look forward to you guys getting your "That League Guy" mask with official Superman T-shirt for Halloween 2012 or so. Nathan C. sent me this story from NPR.org. 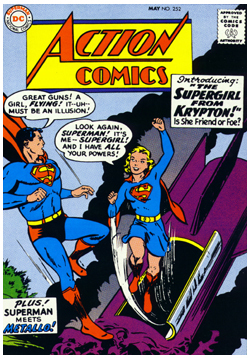 The article discusses the classic Superman story, "Whatever Happened to the Man of Tomorrow? ", now collected in hardcover by DC Comics. This will seem odd to folks who don't follow comics, but in 1986, DC decided to "reboot" their comics, believing that the then 50 years of history were a problem for storytelling as well as bringing in new readers to comics. Editor Julius Schwartz hired an up and coming comic-writer from across the pond by the name of Alan Moore. Moore would set about telling a story about the last battle for Superman. 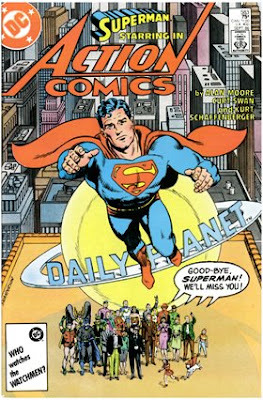 It's an oddly melancholy story, and one of my favorites for many reasons (including Curt Swan's phenomenal art). Anyhow, you guys probably don't care too much, but I'd remiss if I didn't mention the article as it discusses the reissue of not just a great Superman tale, but the drawing to a close of one of America's original myths. So, if it matters, no... I did not get to meet Elvira, Mistress of the Dark. There's a bit of tragedy to my tale. I've talked about Elvira before at League of Melbotis, as a special October Dames in the Media the League Once Dug. Television icon, movie star and more... Elvira has outsurvived the vast majority of icons of the 1980's, when Elvira went from local LA curiosity to writer, star, rap artist, etc... of her own feature film. Elvira had been invited to appear as a Guest of Honor for The Alamo's "Hey, Homo" series, and would host an evening at the Alamo Village further north in town, but Justin landed us tickets for her hosting of the 1988 feature "Elvira: Mistress of the Dark" at the Ritz. I left work with a splitting headache, got a Powerade at the Wendy's and headed to Austin Books, where I ran into shop-owner Brad Bankston. Anyway, I almost lost track of time talking to Brad about all things awesome (dude, owns the best shop in Texas, or maybe The World. That's what happens), grabbed my comics and headed down to 6th Street. I met Justin at LoveJoys (where I don't think I'd been since the mid-90's, but not much has changed). At 8:30 we got in line, and I believe Elvira arrived via limo at about 8:40 to wild applause, and we entered at 8:50. For those not in the know, the way things work at the Alamo: you arrive early because they have a full menu and bar, so you can order food which arrives before and during the film (its not obtrusive, you just have to believe me). During that time, they show short films, videos, etc... tied to the movie. In fitting in with Elvira's past a B-movie hostess, we thrilled to a wide-array of 60's and 70's era low-budget horror movie trailers. I was surprised Elvira didn't actually appear prior to the movie (except for calling down from her prize seat in a balcony), but I think it worked well. In a way, the 90 minute film was really a warm-up to the QA and appearance by Elvira which followed. The movie is one I had only seen on home video, which Elvira explained a bit about. The movie did have a marketing push, but the week that the movie was to be released, distributor New World Pictures (former owners of Marvel Comics, natch) went bankrupt. This led to the movie not actually getting released in nearly as many theaters as originally intended, and it basically couldn't succeed. However, I still think that the movie, especially once Elvira arrives to claim her inheritance, is pretty darn funny. And it has the best ending sequence. Ever. I love a good musical number. Yes, she was in full costume and character (although questions for Cassandra Peterson, her alter-ego, were inevitable). Yes, she looks exactly the same. I was pleased that Elvira was just as funny and sharp as ever, and rode that fine line of bawdy, brassy wacky and sweet that has been her trademark. Yes, all of that's apparently real. Elvira is a well-known animal-rights advocate, but it was hilarious to hear her complain about the poodles used in the production of the movie. 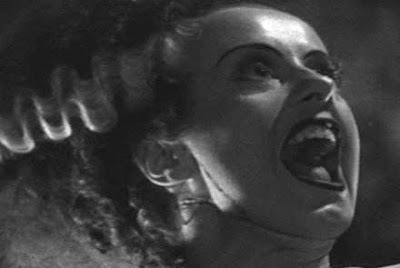 And, you'll be happy to hear she still owns the Macabre Mobile. Anyhow, afterward we were supposed to be able to go out and get in line to meet Elvira, get an autographed picture, DVD, etc... However. The League had to go to Waco this morning by 9:00 for work. So, rather than get in line, I had to abandon my partner-in-crime, JAL, and head home. I wouldn't mind being a little sleepy, but that's almost four hours on the road and sleepy, and that's a terrible combo. JAL, however, did not head home. And he made a new friend. Reportedly, JAL landed me a signed photo, so I hope Jamie doesn't mind that finding its way onto my nightstand. In addition to having a great time (thanks again for the tickets, Justin), I was glad to see what one of these events is like at the Alamo, and I think I'm a lot more likely to go back. The Elvira event, btw, sold out as fast as any other event they've had, in about ten minutes. Go figure. I went to see Elvira at the Alamo, and I have to be in Waco by 9:00. My worlds collide. You get no post. 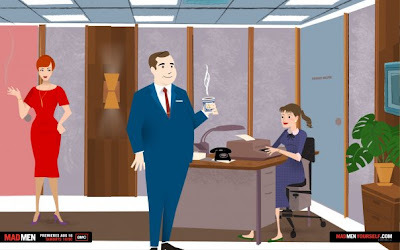 Click here to bring yourself into a world where you share space with the cast of AMC's Mad Men. 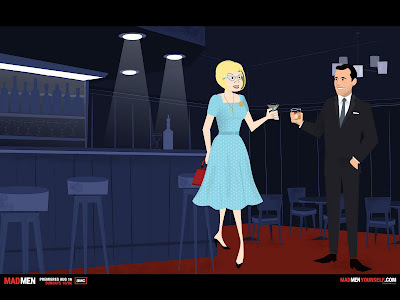 And here's cartoon-styled/ idealized version of The League impressing the dickens out of Joan Holloway. And I still get a cup of coffee. The world is as it should be. My relationship with the film "Pleadings" began, technically, in the Fall of '97 when I took a screen writing class and met JimD. JimD may not remember this, but I was reading comics before class began (I think "Preacher"), and he asked me what titles I was reading. He was a former comic enthusiast, and was happy to chat. I found Jim to be an excellent sounding board for my own projects at the time, and we became quite chummy. Jim would head off for law school at the end of that year, but we remained in touch. While Jamie and I languished in Arizona, Jim sent me a copy of a screenplay he'd written. I wasn't entirely surprised he'd asked, as we'd taken the same screen-writing coursework, and I guess he knew I'd been trained to be honest with feedback, as he'd been trained to take or leave what I had to say. We discussed characters and plot elements with which I agreed and with which I took exception. But I was very excited for Jim. He had a plan, he had a director, and he was ready to begin pre-production. It's a hugely unique situation for anyone to find themselves who claims to be interested in film production. Jim had recruited a long-time pal to come on board to direct, and the two were of a like mind on the project. Prior to my return to Texas, Jim and Alistair completed shooting the film in Beaumont. I deeply regret not being available for the shoot, but them's the brakes. As of this writing, the film has been published to DVD. I am unaware of further distribution plans, but hope that this post will remind local readers that I will be watching the film at League HQ on Saturday Evening, Aug. 1. We'll be breaking out the good stuff. Always looking for good copy, I asked JimD to allow me to interview he and Alistair, via e-mail, on the topic of "Pleadings". Below, you will see our exchange. At the time of the questionnaire, I had not seen the final cut of Pleadings, but had seen a fairly-final, locked cut about two years ago. I now hold in my hand a clam-shelled, lovely DVD. It includes a furiously written note by Jim D in which threatens me with bodily harm several times. The threats have nothing to do with the film. I should note: I also wasn't sure if JimD and/ or Alistair would answer the questions. We got both. So, here's two responses per question. 1) Can you discuss a bit about how Alistair and Jim know one another? Had you collaborated previously on a project? Jim: Alistair and I have known each other since 1989. We both attended the same middle school in Houston, Texas. We had not previously collaborated on a project, but we had always wanted to do so, and Pleadings offered us that opportunity. Alistair: We've known each other since Junior High. Previous collaborations were limited to very minor music and newspaper related projects. 2) When did Jim begin the script? What was going on in your life at the time? Jim: I began the script in February of 2002, just after taking the Texas bar exam. The initial idea for the film came on February 9, 2002, the day I graduated from Baylor Law in Waco, Texas. Alistair came up from Houston for the occasion. After the ceremony, but before the night's festivities were to ensure, Alistair, my brother Bert, and I decided we would make a trek to the Branch Davidian compound. (I will never forget that on the way there, our Internet directions led us a stray and we passed the last turn. There was a house that had a large sign on it that said "Don't Ask!" and a mile down from that we stopped to ask a farmer for directions. My brother walked up to him, and before he could say a single word, the farmer said, "You missed the turn."). There was very little there that was recognizable, but there was a memorial garden, a church, and a few structures which must have been lost during the fire. We also saw an old burned out bus (which we learned was not consumed by fire during the stand-off but a number of years later). There was something haunting and cinematic about the bus which prompted Alistair and I to brainstorm about collaborating on a film set in Waco. I had the bar exam in a few weeks, but I began to scribble down ideas at every opportunity. The first draft was probably circulated between Alistair and myself in late 2002 or early 2003, although the draft kept evolving up until the time we shot the film in the summer of 2004. 3) Were the characters there first, or the story? Jim: Probably the characters. Initial scenes were drafted based on ideas for the characters, and I had a larger set of characters in play than ended up in the film. As scenes began to come together, I merged a few of the characters, which had the effect of making them more complex. 4) How did Alistair become involved? And what was his prior experience in film production? Jim: Alistair was always involved from that first conversation in February of 2002. I know he studied film at Harvard and had written and created a few short films prior to directing Pleadings. I had previously seen one of his shorts, which was a black and white superhero film about a masked vigilante who felt compelled to venture out into the night to fight crime despite the misgivings of his wife. (You ought to email him and ask him a bit more - his email is [withheld]). Alistair: First, my prior experience: I had always dabbled in low budget movie making, even when I was a kid I played with video cameras. My main training came at University, though, where I took two intensive filmmaking classes. The first culminated in a class project, a 20 min. documentary on taxidermy. The ten students in my class shot the entire thing themselves (on film), taking sound, crewing, editing, etc. It was a great experience taking a project through from beginning to end. Then, I took a year off, and during that year shot a 10 min. B&W, silent short with friends. When I returned to school and took my second filmmaking class, that culminated in me directing my own 15 min. short, a movie about a failed superhero called "Episode 23: The Masked Avenger Meets his Match" (his match being his girlfriend, who in the film accuses him of neglecting her for his superheroic shenanigans). I was involved with "Pleadings" from essentially the beginning, when we hatched the idea together in front of a burned out bus on the Branch Davidian complex, Waco. However, for the first two years, I was basically just a script consultant, the script, story, characters, etc. was all Jim. I merely read some drafts and brainstormed over the phone with him. My really serious involvement didn't begin until we decided to shoot the thing in 2004. 5) Dogme95. Your film more or less fits in with what was considered to be a fairly considerable statement during the years when CGI and digital technology were rapidly changing how film and television were created. What attracted you to the approach as statement and aesthetic? What did it bring to the screen that you felt a more traditional approach might not have pulled off? Jim: We do break a few of the Dogme95 rules, as we have some artificial light and music on the soundtrack. The neat trick about Dogme95 is that it effectively turns a lack of money and resources into an artistic statement. We thought about rigidly conforming to the Dogme95 rules in order to obtain a certification from the official Dogme95 entity, but we learned that such certifications were no longer being offered by the time we were gearing up to begin principal photography. There is definitely an immediacy to the approach which suits the emotional themes in the film. Let me add also, and you can quote this, that the shooting style Alistair adopted for the film perfectly corresponds to the type of angry and melancholy narrative I had formulated in the script. The rawness and immediacy of the documentary style digital video approach complemented the emotions experienced by the characters. I cannot imagine it shot another way. Alistair: Well, the Dogme movement was both a blessing and a curse to low budget filmmakers. It was a blessing because it showed that intense emotional stories didn't need to involve any Hollywood trickery - in fact, the best Dogme films demonstrated that on-location shooting, no artificial lighting, and a handheld camera could actually be *more* emotionally intense than a lit set and standard camera setups. The movement was a curse, however, because it was too easy to see it as a mere excuse. I don't have the money for lighting, so I'll just claim my style is Dogme. So, if the production was big budget, shooting Dogme-style would clearly be a choice, if it was low-budget, the question of shooting Dogme-style might become a necessity, and thence not an aesthetic decision at all. For my part, it was a little of both. I'd observed that low budget attempts to look Hollywood often came off exceptionally fake. One big problem with the approach is bad lighting. Another big problem is acting - not necessarily even that performances are bad, but if you are constrained to a certain camera set up and a certain lighting situation, you are also constrained to using certain takes. This means you may be forced to accept poorer performances just because they're the ones that fit with your pre-assigned camera movements, etc. So, the stylistic choice to shoot Dogme was motivated partly by economics, but more so as a strategy for eliciting the most realistic moments from the actors. By shooting the film "documentary style" with very little additional lighting, actors could do very long takes, staying in character, they could move freely around the set, they could allow themselves to be in the moment. Many scenes were shot like this - do the entire scene, with all actors, in one long take. Then I, as camera man, would literally document their interactions using much the same approach a documentary filmmaker would use. In the editing room, however, rather than obscure many of the artifacts of a the hand held camera work (this would be the usual strategy while editing a documentary film), I left many of them in. This stylistic choice was meant to both a) allow me to make choices based more closely on the performances and the energy between the actors (not just camerawork), and b) to create the impression of actual events being observed. 6) You've pulled together a talented cast. There's some interesting stuff in the script for an actor. How did they react upon reading the full script? What sort of questions did they have? Jim: The cast seemed pleased with the script. We were very, very fortunate to assemble such a talented and versatile cast. We had three rounds of auditions, for which we posted notices on casting email lists and such. The first round was a full day in Houston, followed by a similar day in Beaumont, which culminated in a full day of callbacks in Houston. Some of the actors had questions about the legal issues in the film. But the members of the cast threw themselves into the characters and needed little, if any, instruction on bringing those characters to life. Alistair: My recollection was that all the actors were enthusiastic. Our leads especially put a lot of work into exploring the motivations and creating backstory for their characters. 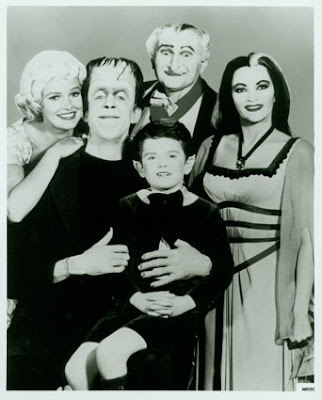 Some characters which spent relatively little time on screen together, for example, spent a lot of time together off screen in order to build up the rapport the script indicates they have together. 7) A little bit in the way of nuts and bolts: Give us a breakdown of how an independent movie on a shoestring budget secures locations. What was the duration of the shoot? Jim: The shoot lasted the entire summer of 2004. We were fortunate in that most local businesses were happy to assist us. There is a novelty to shooting a film in Beaumont that no longer exists in Los Angeles or say, Vancouver. That said, I wrote the film with certain locations in mind with an eye toward places that would be more likely to allow us to shoot there. (Moira's apartment in the film was actually my apartment at the time (although only the exterior; the interior was a display unit at another complex). The courtroom was the most difficult location to acquire, but in the end, one of the district court judges allowed us to use his courtroom, where we shot for a full Saturday. Alistair: Shoot was about 2 months, maybe a totall of 6 or 7 weeks, but not filling everyday. Much of it was shot in spurts (such as the extensive party sequence, shot in a long weekend at a single location). Locations were found either by our production managers, or through friends. All the domestic interiors belong to friends except for Moira's apt., which was a showcase apartment in a friend's complex. 8) With the writer and director both there, what sort of consultation did you go into with the actors? What surprised you once the cameras were rolling? Jim: I myself did not attend all days of shooting. However, when I was present, I would offer input if asked. Usually on procedural issues or character motivations (although Alistair did allow me to almost direct portions of the law school scene since that was such a familiar thing to me). There were many surprises once the calendars were rolling; Alistair and I were on the same page about actors ad libbing and going with the flow and where the scene takes them. Some directors want firm adherence to the script; we were shooting on video and wanted to see what happened when the cameras began to roll. It was nice to see where the actors took the characters. Alistair: I think once we were shooting, I was in control. However, I was juggling many tasks at once - in particular trying to direct and operate camera at the same time is exceedingly difficult. Jim was an enormous asset on set as he was able to keep his eye on performances, the appearance of locations, etc. while I was distracted by technical issues. My recollection is that the actors frequently consulted with him about everything from the exact pronunciation of a legal phrase to their emotional motivation in a complex scene during shooting. 9) What surprised you most once the thing was assembled as a rough and/ or final cut? Jim: I think what surprised me most was the fact that the film was too long when I was worried it would be too short. We had a lot of really great scenes that we had to cut in order to streamline the movie to a more appropriate length. Alistair: rough cut - yay, we succeeded in telling a story! In moving from the rough to the final cut, it was remarkable how the storytelling got better as we cut out character development and secondary plot lines. However, I think you can still feel these cut scenes in what's on screen. We basically discovered what was redundant in a way that simply couldn't have been done until after the original screenplay had been shot and edited. 10) My mother-in-law reads this blog. Tell Judy, using your best elevator speech, why she should watch your movie. Failing that: why didn't you write me a lead role in which I get to shoot guns and pitch woo to all the aspiring starlets your casting could handle? Jim: There is a roll for you in "Pleadings II: Summary Judgment". We made this film because we wanted to rebel against certain formulas; the familiar exposition through dialogue, the overexposure of NYC and LA, and the general campiness of movies about young adults. This is a darker film which is more serious in tone which requires some thought and post hoc reconstruction. But that's just my writer's pretense. Judy should watch the film because there are some very honest and powerful performances from some actors that she has never heard of. Alistair: Find us the funding for the next film and we'll definitely give you a part. With guns. Judy - don't watch "Pleadings," it's too depressing. Were the film terrible, I would still be incredibly impressed and proud of JimD and Alistair (and their talented, young cast). Mounting a feature is an incredibly difficult process, and because of the complexity of the task, 99.99% of the features dreamed of go absolutely nowhere. 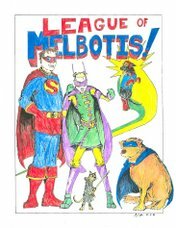 However, in addition to actually finishing the movie, The League's memory from two years ago offers up high recommendations. The actors are, great, the script and direction is tight, and while no laugh riot of a movie, it's depth makes it engaging viewing. So congrats to JimD and Alistair. Its been a long time in coming. And special thanks to JimD, the initial inspiration for this blog, an attorney to the stars, and now a fancy movie writer. Monday is the birthday of League-Pal and former house-mate, Nicole. We all wish Nicole a happy birthday. Nicole is so nice, we're celebrating twice. Saturday we went out, and we're going to Long John Silver's Monday evening for her B-Day. It is ALSO the birthday of League-Mother-in-Law, Judy. Look, I know how these mother-in-law things can go. I hear stories. So I thank my lucky stars each and every day that I got Judy as part of the package. More from Troubles, including pictures. As I don't attend San Diego ComicCon, I spend a lot of time reading up on the panels. These days, with YouTube and sites like Newsarama.com incorporating Tweet-line live posting (which archives) on each panel, I can get through an hour of discussion, etc... in about 6 - 10 minutes. And after reading these reports for the past 7 years or so, someone from SDCC really, really needs to begin handing out a flier with the entry pass on "Are you wasting your time and everyone else's with your question? (ie: Is your question stupid?)" At any rate, DC and Marvel have finally realized that their clever hints at SDCC and other Cons were giving away entirely too much, so the panels aren't exactly useless, but its hard to say what one would get out of a lot of the discussion. 1) Superman titles are mostly planned out through 2010. That means fairly stable creative teams and a vision for the books, as they've had since Idleson took over as editor. 4) The re-launched "Adventure Comics" will be where I can see Krypto. 5) DC is building its line around known, workable franchises. Sounds like we may get not just a new "Flash" series, but a "Kid Flash" series. Also, two JSA series (which is fine, that's a huge cast). I won't be shocked to see two JLA titles before all is said and done. 6) Reports about the upcoming animated, direct-to-DVD Green Lantern movie were very positive. Sounds like WB got 4000 people to simultaneously give the GL oath. That's just awesome. 7) Marvel seems to think they own "Marvelman". I'll eat my hat if they didn't just purchase a whole mess of legal trouble, but it's something. 8) Mattel is putting out a "Movie Masters" line, that will include a General Zod figure and Christopher Reeve Superman. If it does well, they will continue the line (hopefully with Ursa, Non, Jor-El, Lara, etc...). 9) Mattel will also be releasing a Power Girl and Question figure. I'm mostly done with non-Superman collectibles, but I'd pick those up. There are also a few other Super-related items I'll be looking for. 10) This shocks even me, and I know they'll fail me, but some of the conversation at the "Smallville" panel sounded promising. Also, Johns is writing a JSA episode. Which is awesome. Please, oh deities of the DCU, give me Jay Garrick and Alan Scott (and Carter and Shayera Hall, if it won't kill you). 11) Ready for Cameron's "Avatar". 12) Marvel is doing some anime cartoons of their properties. Iron Man looks ridiculous but cool. 14) "Boom" having so many darn announcements is just good news. 16) I may actually pick up Doom Patrol. 17) Two of my three hopes for a "prop replica" from DC Direct were on display, as "coming at some point". A Batman utility belt (which I will not be able to afford) and Wonder Woman's tiara and bracelets. I eagerly await the pricepoint on the tiara and bracelets. All in all, looks like another good year. DC and Marvel are changing their editorial tactics to work with the collected format and their older audience. Its an interesting growth in how narrative is managed. There were plenty of announcements that left me unimpressed, but surprisingly few that made me cringe (in fact, none come immediately to mind outside of the clip I watched of Marvel's anime-animated Wolverine). Outside of Doom Patrol, Marvelman and a few items from "Boom", I haven't seen any comics which caught my attention, which is odd. It seems my reading is inline with the narrative thrust, at least at DC. I just don't pay too much attention to Marvel these days, and saw no notes about Captain America, etc... that I thought were terribly exciting. I've put up a poll at the official LoM site (in case you're getting your LoM from Facebook or RSS). Jamie and I are trying to decide if we should have our annual Chris-Kwanzaa-Kah party, or if we should consider a Halloween Party. Halloween falls on a Saturday this year, so it makes it possible for us to throw wide the doors of Haunted League Manor and celebrate the night of ghouls and goblins. 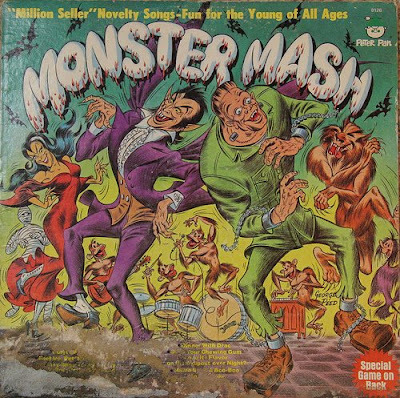 I actually remember buying this copy of Monster Mash at a K-Mart in Michigan when I was little. I thought the Wolfman looked awesome. And I have never known why a "monster band" was made up of chimps. Our primary concern is that nobody is going to show, of course. And while the Holiday Spectacular is something to get ready for, its also decorations we have up for a while during the Holidays. If we spend a bunch of time making League HQ as spooky as necessary for a Halloween-mitzvah, this is sort of a one-shot-deal. Anyhow, I'd initially thought: We're going to do a Halloween Party, and I am going to make everyone come as a super-hero! And it'll be a super-party! But now I see that's faulty thinking on Halloween. Let's get the whole gang together! While Costumes WILL BE REQUIRED (that includes Sophie, Maxwell), we're looking forward to what Leaguers decide makes for a festive Halloween. So, if Leaguers can take the ten seconds out of your day to vote in our poll, we'd really appreciate it. This is sort of our bellwether for the likelihood of The League's 2009 Halloween Heckstravaganza.